This splendid gho is a man’s traditional garment in Bhutan. 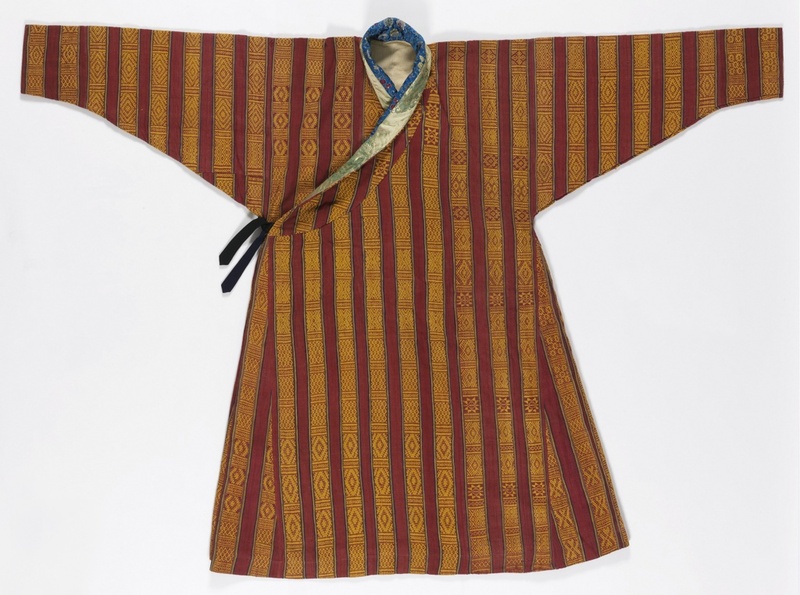 The robe is comprised of loom lengths of cloth stitched together vertically. The cloth itself, woven on a backstrap loom, is likely the work of a woman in the original owner’s family. When worn, the gho is closed by an overlap tied under the arm and its roomy bulk is given structure by two pleats carefully arranged in back. A belt at the waist holds the gho in place. A gho is made long and adjusted to knee length by pulling cloth up and over the belt, creating a copious pouch that is used as a carry-all. A man usually wears his gho with white shirt collar and cuffs that protect the cloth from wear and soiling. Ghos can be worn over shorts in warm weather; in winter, a shirt or sweatshirt can be added underneath along with trousers. Accompanying footgear ranges from none to elaborately embroidered boots, or more commonly these days, knee socks and athletic shoes. Cooper Hewitt’s gho is special, woven with wild silk in an extra-warp patterned plain weave known as aikapur, at one time particular to the eastern part of the country but now esteemed as a national design distinct to Bhutan. The much-loved pattern in red and yellow is named mentsi marthra for the color scheme. This mentsi marthra gho is trimmed at the neck with luxurious imported Chinese silk brocade, a sign that the original owner commissioned it for a very formal occasion. The mentsi marthra pattern is still highly esteemed. For the ceremony of receiving the Raven Crown at his coronation in 2008, the current king His Majesty Khesar Namgyel Wangchuck wore a twenty-first century version that also incorporates extra-weft shinglo patterns. The Cooper Hewitt gho was acquired in the early 1960s at a critical time in Bhutan’s history. The country’s then king, Jigme Dorji Wangchuck, was initiating a concerted push for modernization. Textile lovers and those who treasure traditional arts regard him as visionary. Even as a road was being built across the country and schools and hospitals founded, Bhutan instituted a parallel emphasis on maintaining and supporting indigenous painting, sculpture and weaving. The Royal Government of Bhutan instituted the Zorig Chusum to train artists, the National Museum to exhibit and preserve fine examples of the country’s arts and the wearing of traditional dress to strengthen national identity and insure future for handloom weaving. The appearance of the trend-setting current king, half a century later at his own coronation, wearing a contemporary interpretation of a mensti marthra gho with shinglo motifs, attests to the surprising vigor of weaving in twenty-first century Bhutan. Susan Bean curates, writes, and consults on the visual arts and culture of modern South Asia. She collaborated with Diana K. Myers on the exhibition and companion book From the Land of the Thunder Dragon: Textile Arts of Bhutan.